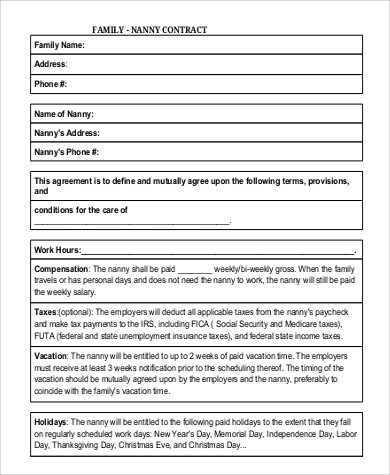 A nanny is typically one who works taking care of children, but her scope of work has to evolve into including other household chores should the need arise. While the nanny should do other domestic chores, ideally her responsibility lies on taking care of the children under her ward. It can be a demanding work and stressful job that few are able to handle but can be a challenge that can be tackled to those who are still in their 20s. 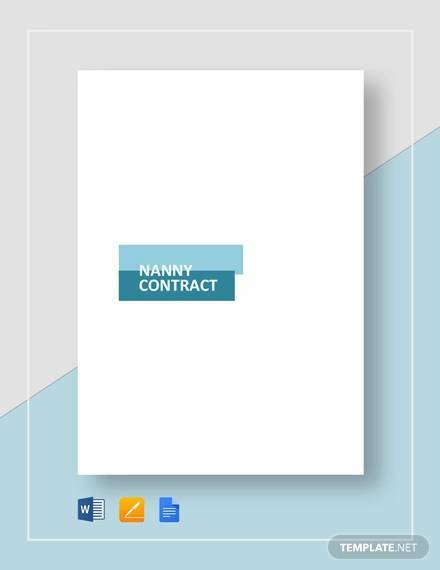 Our free downloadable Sample Contracts for nannies can be edited or modified according to your specifications and are available in either Word Doc or PDF file. 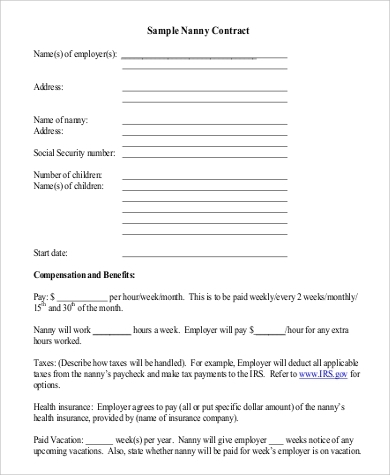 Employed in either a live-in or live-out basis depending on the contract agreement. Besides child care, she is tasked with cleaning the children’s rooms and bathrooms and other cleaning duties. Typical hours are 40 to 60 hours a week and able to do unsupervised work. 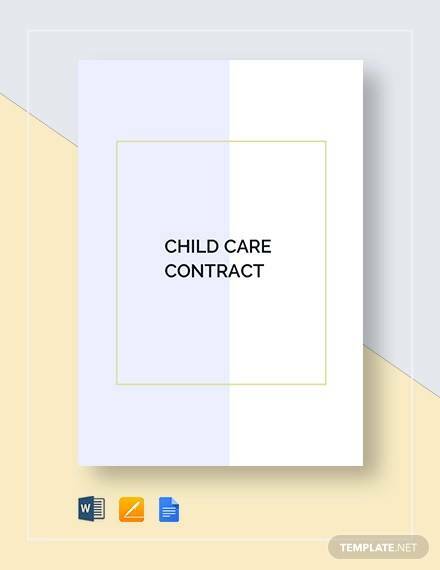 Besides children’s schedule, she’s expected to take care of the parents’ schedules themselves including doing office tasks and other errands relevant to her job description. 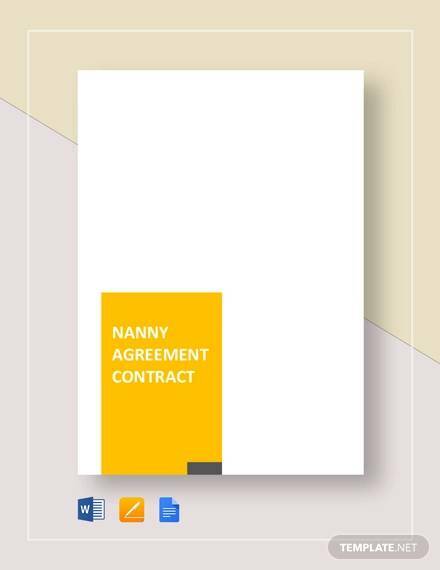 Besides offering nanny contracts, our website also offers Sample Lease Contracts and Sample Sales Contracts for those who want to lease property or equipment and contracts to sell items. These are all free for downloading and printing. 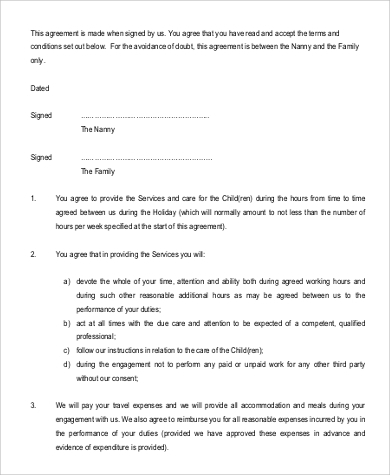 Before being employed, families should be able to make nannies understand that they should always conduct themselves professionally because they are part of the family. Since they are working mostly with children, she is expected to develop strong connections in the family. Being a nanny is both a teaching and learning experience. Children learn a lot in their formative years from nannies and the learning process go both ways. Nannies learn from kids’ behavior and ways and these can be applied later on when they move on to other careers, most notably when becoming a teacher or child psychologist. 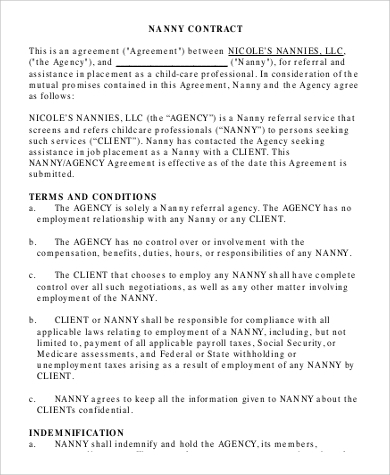 On the other end, parents who hire nannies should weigh their expectations carefully. Most nannies cannot meet parents’ high expectations and they should learn to adjust accordingly. 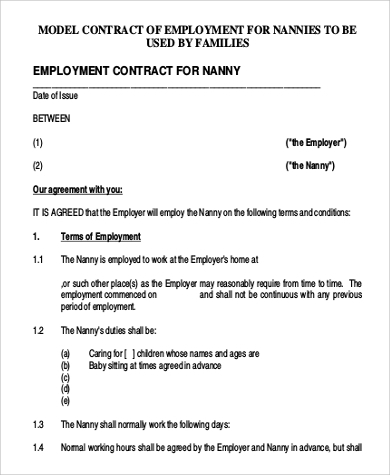 There are laws in place to prevent abuse of positions, and these are intended to protect both the nanny and those who hire her. 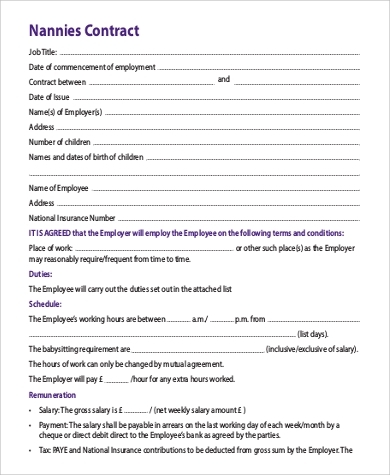 For other job descriptions Sample Employment Contracts are available to view and download. 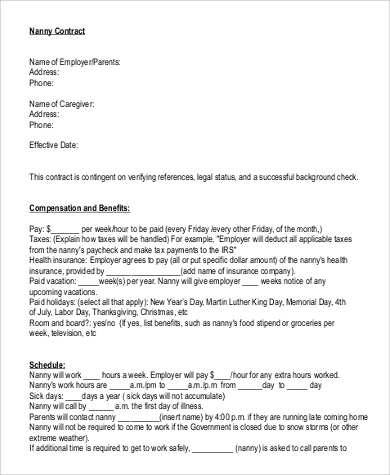 These cover several kinds of employment contract for different fields of work. These can be modified according to specifications of the employer and are available in both Word Doc and PDF files.